Phloretin is an antioxidant flavonoid found in root bark of apple trees and from apples to preserve the fruit from decomposing quickly. In short, phloretin can help repair free radical cell damage, lighten skin, suppress certain skin cancers, inhibits A.G.E. and MMP-1, and is an anti-inflammatory. Note that Phloretin CF can be drying to the skin, as it uses denatured alcohol to help penetrate the ingredients into the skin. 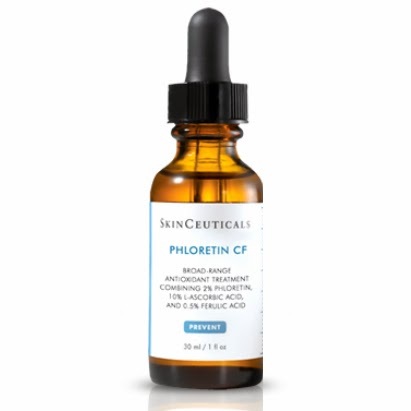 because of this, Phloretin CF is only recommended for Oily, combination or normal skin, not dry skin. Free radical damage from environmental factors create a process of damaging cells by stealing electrons of lipids in the skin cell membrane. Vitamin C can prevent this process from starting, while Phloretin and Vitamin E can repair this chain reaction of damaging cells once it has occurred. It also has skin lightening properties and reduces age spots to treat hyperpigmentation from it's ability to reduce tyrosinase. Tyrosinase is an enzyme found to regulate the output of melanin cells in the skin, it is 10 times more active in black skin as in caucasion skin. Melanin is the pigment in our skin, which is important to help shield us from UV rays. However if overproduced in areas it can create darker age spots and uneven skin color. Controlling tyrosinase if melanoma ( skin cancer ) is found is important, as it can make the cancer flourish if uncontrolled. Phloretin has also been shown to inhibit growth of several cancer cells including B16 melanoma, HL60 Human Leukemia cells and HT-29 human colon cancer cells. Rigid skin cells occur during aging which result in skin not being elastic and wrinkles, caused from advanced glycation enproducts, or A.G.E. Phloretin can inhibit this glycation process to improve elasticity by being an inhibitor of sugar being transported through red blood cells. This allows for sugar to be delayed into being deposited into skin cells. MMP-1, or matrix metallo-proteins breaks down the fibroblasts in the skin that build the collagen and elastin structure of the skin. Phloretin inhibits MMP-1 which is why great results in improving elasticity in the skin have been found.